Thanks for posting. Picked it because I have never found time to play this on other platforms. It will be nice to have a physical copy with all the bells and whistles. I'd almost buy this even though I've not found a switch yet but be nice to have a copy that only 3000 was made of. Only thing holding me back is I played this on PS3 years ago but am wondering what is in this copy not on my PS3 digital version from years ago. People really are that stupid. Total YMMV: thinkgeek just sent me a 20% "thank you" coupon for buying the SNES mini classic. 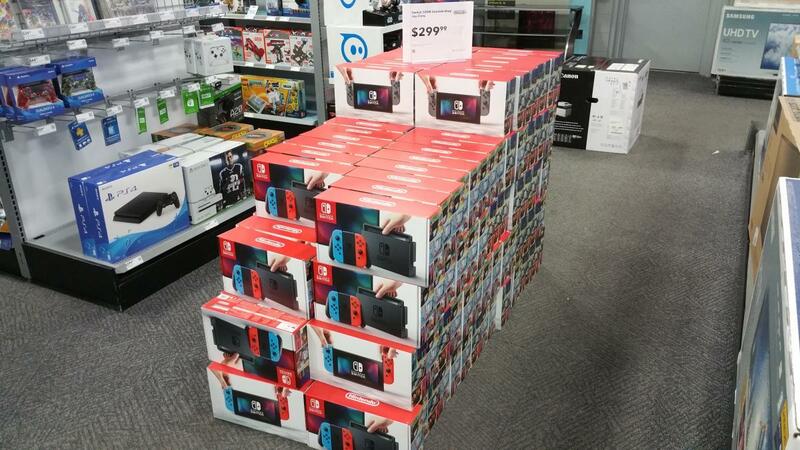 Coupon worked on their Switch bundles. why purchase the bundle at 379, when you can buy a console for 299 plus a physical copy of super mario for 47 dollars wih gcu? Gotta charge you an extra $20 for that case and them exclusive red joy-cons, breh! No tax for me since I paid with trade credit 😁. If your in the Fort lauderdale, florida area the Best buy in Davie at tower shops had like 10 easily just this monday. I counted about 5 gray, 5 neon. zip is 33324. Everyplace I've gone in the last week has had stock, as well as many online retailers. Even Amazon has the grey units, and are taking orders for the neon to ship when stock arrives, which is a first. The Mario bundle has also been available for preorder for awhile as well, and I haven't seen that sell out yet. I'm going to hold out until black friday. I need to sell my wii u first. I'm hoping to get 250 for the console (zelda edition) with mario kart, tropical freeze, zelda-twilight hd, ninja gaiden, punchout (wii), super mario u, and legend of zelda skyward sword. Think I'm overpriced or under? Depends on completeness and condition. If everything is like new, and you have 100% of the box, manuals, etc., you could maybe get more. Presentation and condition are key to top dollar. I'm getting ready to list my sons NES Mini, and when potential buyers look at my pictures and description, they'll see what is pretty much a brand new system. Had a $30 gift cert to use this week so i bought the neon yellow joycons. Good deal? or should i have used it towards something else? Ummm, your pretty much the only person who can say if it was good deal or not. If there was something you wanted more, then yeah, it was a bad buy, if you wanted them, then a sound choice. Damn 24gb for a physical copy? I don’t mind as long as it can closely resemble the other console versions. Yes. They are generally good. The recent Odyssey bundles I've seen are likely from scalpers that have damaged inventory because the price is higher than retail. I don't think Amazon itself can sell damaged inventory at higher than retail price this soon after release. Thanks.....just hesitant, I suppose I can return since Amazon has a general good return policy if something is damaged. Nintendo does lots of limited edition consoles, anything Mario or Pokemon appreciates in value like crazy. That does it, I'm taking all my IRA savings and dumping it into Mario and Pokemon products.